Measuring opens and clicks may tell you something about email performance, but it says nothing about the impact that email campaign had on qualified leads, or opportunities, or revenue. This year, take your reporting up a notch and make a commitment to show the true impact that your programs have on the company’s bottom line. If you don’t have that capability in place, look at marketing automation platforms like Marketo or reporting solutions like Full Circle CRM that can give you the data you’re looking for. The only way to improve the effectiveness of your marketing strategies long-term is to test, and test consistently. Sure, when you’re pumping out campaigns every week, sometimes even a subject line test seems like a bridge too far, but it’s worth the effort. How else do you know what worked and what didn’t? This year, test something in every campaign. Just changing a word or the color of a registration button can make a big difference. 3. Make your blog count. Blogs have long been the exclusive province of the PR team, but demand generation marketers are starting to realize the potential for blogs to generate leads in a big way. If you don’t want to fight the political battle, let the PR team have their way and create a second, separate blog that’s less brand-centric and designed specifically to generate leads, subscribers, engagements, and ROI. 4. Make content a part of every campaign planning discussion. “What’s the offer going to be?” is not a question to be asking in the creative process. The right offer is central to the success of any demand gen program, so make offers and content a core element of your planning (and budgeting) process. Besides, good content will fuel demand gen success much more quickly than clever creative. 5. Improve SEM conversion rates. It’s a pretty sure bet that Google will change their search algorithms again this year, and SEM practitioners everywhere will tinker away under the hood of their precious PPC campaigns, in a valiant attempt to stay ahead of the curve and the competition. Fortunately, there’s a part of your paid search program over which you have much more control: landing pages. Even a modest lift in conversion rates (click to lead) can decrease cost per lead dramatically. 6. Set up an autoresponder campaign for all new campaigns. Studies have long shown that responding to new leads within minutes, not just hours, increases the rate at which those leads are qualified and converted to opportunities. Yet many B2B companies, even those with marketing automation in place, fail to have autoresponder programs in place that respond instantly and systematically to new leads. An effective autoresponder program complements your telesales team by increasing contact rates and highlighting those leads that need the most attention. 7. Improve segmentation to increase relevancy and email performance. Most every B2B company has a target audience consisting of multiple buyer personas – whether job titles or verticals. If you take a “one size fits all” approach to lead nurturing or email marketing, you’ll be forced to adopt a generic message that’s less impactful overall, and probably irrelevant to a large segment of your audience. Segmenting your campaign into different target groups doesn’t have to mean entirely new creative; even a sentence or two can help an email be more relevant to an individual recipient. Infographics don’t always command respect. Sure, they’re fun and don’t have the gravitas of a 19-page white paper or industry report. But guess what: not everyone wants to read your report. And infographics can be highly effective at capturing early stage prospects or mixing up the content in your nurturing stream. 9. Find old content and update/repurpose/recycle. Speaking of infographics, they’re also an easy way to get more mileage out of existing content like a Webinar or industry survey. If you struggle with the constant demand for new offers – and who doesn’t – maybe it’s time to mine some of the gems in your Website’s resource center. Maybe that “hot topic” of two years ago needs a fresh perspective. Or that hard-working white paper could see a second life as a series of short videos or slideshares or blog posts. 10. Clean up your database. “Bad creative to a good list will always outperform good creative to a bad list.” If your data’s bad, no amount of work or creative expertise will make a difference. This year, quit complaining and do something about your crummy data. Get rid of the duplicates. Delete non-responders. And consider third party services like ReachForce who offer a free analysis of your CRM data that tells you how many of your otherwise unusable records they can append, update or enrich. This entry was posted in B2B Marketing, blog marketing, Campaign Measurement, Campaign Strategy, Database Marketing, Demand Generation, email marketing, Google AdWords, Landing Page Optimization, Landing Pages, Lead Management, Lead Nurturing, Marketing Automation, Marketo, search marketing, SEM, Social Media, telesales and tagged autoresponder campaigns, b2b demand generation, B2B lead nurturing, Demand Generation, demand generation best practices, demand generation strategy, demand generation tips, full circle crm, lead nurturing strategy, lead nurturing tips, marketo, reachforce on January 6, 2014 by Howard Sewell. For #4, getting good content isn’t always easy. One often overlooked option is to get customers to review your business (Yelp, TripAdvisor) or provide references/testimonials. Sid – agreed. One further option for customer testimonials is TechValidate (see this earlier post: http://bit.ly/1f8DU8T) – the company automates the collection and presentation of “customer evidence” for use in marketing and sales. 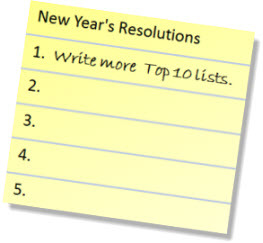 Howard, I love the list you’ve created here and you’ve added exactly 2 items to my new year’s resolutions. I would like to vouch for testing. Email subject line tests are my standby since as marketers we are supposed to test only one thing at a time. But – I break that rule on occasion to test a completely different creative approach against the more boring and formulaic one. This is an especially useful tactic when your marketing is stuck in a rut or there is concern that something new and untested will fail. I’ve also gotten fairly scientific around testing elements – just because the first two emails with an added image outperform their text only controls, it may not apply as equally to webinars and content. I find the greatest value of testing is how quickly you can propel real increases across programs with the winning ideas.